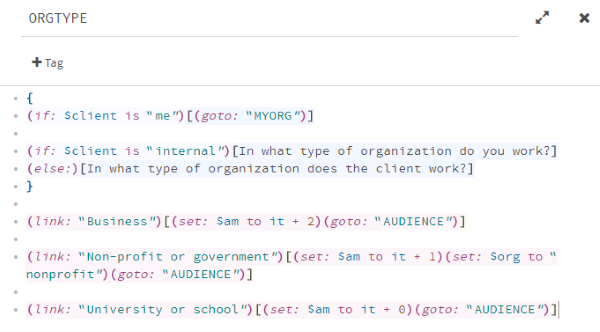 I talk a lot about using Twine for branching scenarios, but it’s also useful for creating interactive job aids. Here are two examples. Diagnostic tool: Is this a gnome or what? Want to help people diagnose a problem or identify the best person to contact? Be inspired by this fun example created by Krishan Coupland in Twine: A Primer on the Capture and Identification of the Little Folk of Myth and Legend. This is basically a text-based flowchart, sending you down paths depending on the characteristics of the creature you’re trying to identify. This type of interaction has a lot of potential uses in business, where the little folk might be replaced by types of tools, people to contact, troubleshooting steps to follow, or any other type of flowchart-y decision. I’d prefer a quicker, visual flowchart when possible, but this text-based approach lets you include more detail. You can make Twine handle more complex decisions if you use variables. To relieve the pressure on my in box, I created a Twine interaction that answers that question. I used variables to keep track of answers. For example, you might say that your client is a non-profit organization ($org is “nonprofit”) and their goal is to make people feel confident or engaged ($goal is “feelings”). As a result, you’ll see advice tailored for non-profit organizations and feelings goals. You might want to try the interaction before reading more, or the rest of the post won’t make much sense. The variables are set when you answer questions at each decision point. Here’s how one decision point looks. Earlier, the user identified whether their client was external, internal, or themselves. Now they’re being asked what type of organization the client works for. If they answer “Business,” a variable that tracks the action mapping score ($am) gets 2 more points. This score will help decide whether action mapping is appropriate. If they answer “Non-profit or government,” the action mapping score increases by only 1, due to the goal-setting issues that often plague those types of organizations. If they answer “University or school,” the action mapping score doesn’t increase, because it’s likely that action mapping won’t be appropriate. That will get decided in the next question, which asks who the audience is. The questions continue assigning variables and changing the action-mapping score. Users who want to prepare people for a knowledge test will be told early on that action mapping won’t be appropriate. Others will continue until they see the final advice screen. The final screen uses the variables that have been accumulating to display text unique to each variable. Here’s a snippet. In the above excerpt, if you said that your goal was to have people do something differently, you get a confirmation that action mapping will help. However, if you said that your goal was for people to be aware of something, you get some advice on how to change that so you can use the model more successfully. Several additional paragraphs of text appear on the advice screen, all based on the answers you gave earlier and the variables you were assigned as a result. This took some time to develop, but it has also saved a lot of time by reducing the number of questions I get. This kind of tool can reduce the need for training and relieve the pressure on help desks by providing instant answers tailored to each situation. I have used Twine previously, but the help desk idea is clever. I have numerous flow charts which some people hate, this could be a more palatable measure. Have you created one for your famous flow chart for determining if training is an appropriate solution? April, thanks for your comment. I haven’t (yet) made a Twine version of the “Will training help?” flowchart, but it would probably be a good idea. A Twine version would be able to provide more guidance and examples, plus link to other resources.